This District was created to ensure that adequate funding was available for Fire and EMS within the proposed service area. Taxpayers voluntarily approved a 6 cent per one hundred dollar tax on their property to properly fund the service. HCESD #9 Monthly Board Meetings are held at 9630 Telge Road unless otherwise specified. Print a copy of this emergency essentials list and take it with you to the store. Emergency services districts are political subdivisions of the state of Texas similar to school districts or municipal utility districts. An emergency services district (ESD) can provide fire protection, emergency medical response or both. There are more than 310 ESDs in Texas, 32 of which are in Harris County. ​HARRIS COUNTY ESD NO. 9 ADOPTED A TAX RATE THAT WILL RAISE MORE TAXES FOR MAINTENANCE AND OPERATIONS THAN LAST YEAR'S TAX RATE. 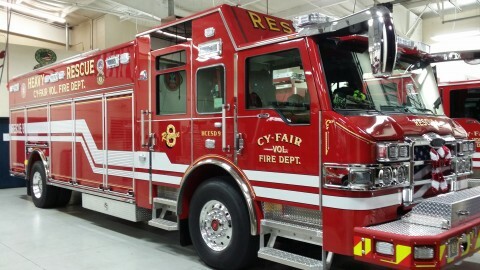 ​We are proud to announce the delivery of the new Rescue 8 purchased in early 2015 has finished and the vehicle is now in service as of December 2015 at Station 8! Click here to download the minutes from our monthly meetings at Harris County Emergency Services Disctic #9. We also nave our latest newsletters available for download.